Nassau Coonty, Long Island is emblematic o continuous sprawl in a inner suburb o New York Ceety, Unitit States. 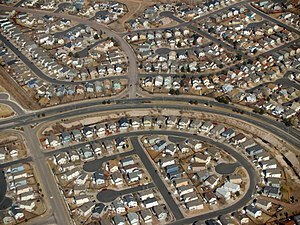 Tract hoosin in Colorado Springs, Colorado-Cul-de-sacs are hallmarks o suburban plannin. A suburb is a residential aurie or a mixed uise aurie, either existin as paort o a ceety or urban aurie or as a separate residential commonty athin commutin distance o a ceety. In maist Inglis-speakin regions, suburban auries are defined in contrast tae central or inner ceety auries, but in Australie Inglis an Sooth African Inglis, "suburb" haes become lairgely synonymous wi wha is cried a "neebourheid" in ither kintras an the term extends tae inner ceety auries. In some auries, such as Australie, Cheenae, New Zealand, the Unitit Kinrick, an a few U.S. states, new suburbs are routinely annexed bi adjacent ceeties. In ithers, such as Saudi Arabie, Canadae, Fraunce, an hintle o the Unitit States, mony suburbs remain separate municipalities or are govrened as pairt o a lairger local govrenment aurie such as a coonty. Suburbs first emergit on a lairge scale in the 19t an 20t centuries as a result o impruivit rail an road transport, which led tae a increase in commutin. In general, they hae lawer population densities than inner ceety neebourheids athin a metropolitan aurie, an maist residents commute tae central ceeties or ither business destricts; housomeivver, thare are mony exceptions, includin industrial suburbs, planned commonties, an satellite ceeties. Suburbs tend tae proliferate aroond ceeties that hae an abundance o adjacent flat laund. ↑ Hollow, Matthew (2011). "Suburban Ideals on England's Interwar Council Estates". Retrieved 2012-12-29. Wikimedia Commons haes media relatit tae Suburb. This page wis last eeditit on 15 Apryle 2017, at 22:36.